The GoMath Tool is an online resource that correlates with our GoMath books. 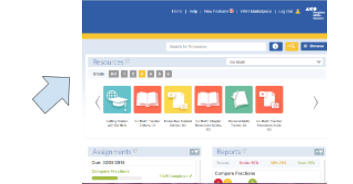 Use the GoMath teacher login to access the student book online for your projectable screen. You can extend your teaching by using the “Math on the Spot” videos as an introduction to lessons or to review. Use the “Interactive Student Journal” interactive lessons to review, preview, or reteach. Both of these videos can be used on the interactive projector or accessed through the student online login. Both of these resources contain math examples worked out, just like the problems they will see in their own journal that are completed independently. Click the number button at the top for your grade level. 4. Attach a photo of your projectable screen with the resource you used.